NEW BALANCE – Kitmeout Designer Clothes – Fashion Blog & Fashion Forum. Heidi Klum, who launched Heidi Klum for New Balance active apparel last fall, is now adding sneakers to the lineup. She reworked the brand’s classic 410 and 320 designs with several new color combinations that launch today exclusively on Amazon.com. Klum’s 410 pair will retail for $90 while the 320 is available on the site for $80. New Balance has transformed their classic 576 silhouette to create the New Balance 576 Pub Pack with three colorways dubbed the Kings Head, the Red Lion, and the Royal Oak. The collection pays tribute to the time honored tradition of whole heartedly enjoying life. For over 20 years this Flimby favorite has been “brewed” in England using the finest “ingredients” and “brewing” techniques. With its Cumbrian brewing tradition dating back to 1982, New Balance combines the very best in heritage, craftsmanship, innovation, and imagination. To celebrate the 576’s iconic status, a limited production of The Kings Head, The Red Lion and The Royal Oak classic connoisseur editions will finally be available in the US at Neiman Marcus starting November 10, 2010. For the fall 2010 season, New Balance Lifestyle is reintroducing the popular heritage Pro Court in both high top and low top styles. Both the men’s Pro Court and Pro Court High add significant comfort and “feel” for on and off court play. They provide relief to the wear and tear of court play and for the price it’s in another league. The Pro Court and the Pro Court High both feature a 12 ounce white duck upper, 12 ounce white duck extended saddle, and for added support and durability, they also come with polyethylene footbed inserts with absorbent terry cloth lining for ultimate canvas comfort. The inserts set to the foot for a custom fit as well as providing extra cushioning. The white rubber outsole comes in a herringbone design for traction and durability which is excellent for indoor and outdoor play. The New Balance Women’s 410 sneaker is a stylish shoe that happens to be lightweight or a lightweight shoe that happens to be stylish. Recognized for its core value of innovation, the women’s 410 has evolved with a new material technology for summer 2010: New Balance is proud to announce an innovative construction of the sonic welded 410 sneaker. Used for technical clothing, tents and industrial fabrics, sonic welding is an environmentally friendly alternate to sewing or gluing. The process of heat and pressure application to the seams of pattern pieces fuses the shoe together cutting out waste and crafting the 410 to be airtight and watertight. The Sonic 410 takes this classic sneaker into a futuristic and modern realm with the new application of sonic welding. The 1100 is a form-fitting, deconstructed, running silhouette designed for lifestyle wear. Designed to provide a 360 fit to foot, the 1100 embodies both fashion forward and functional footwear in a style never-before offered by New Balance. Inspired by New Balance’s running heritage, the 1100 was designed to be both sleek and lightweight. With an upper constructed of mono-mesh, a featherweight textile that results in a nearly weightless shoe and a sole unit designed to provide maximum flexibility and to enhance the fit-to-foot form, the 1100 is truly a first from the brand. A silicone-injected eyerow causes the lacing structure to uniquely form to each foot providing the wearer with a sense of snug comfort and support. The 1100 additionally features custom-injected fine mold honeycomb detailing on the foxing, a silicone-injected N detail, stretch knit on the tongue and toe on the forefoot, lightweight foam midsole that provides both support without bulk, a heel that features Abzorb cushioning and a velvet-like textile to give the shoe a soft lining on the heel collar. The New Balance M996 has been reissued in limited production and will be available exclusively at Fred Segal in LA. The classic heritage running sneaker from New Balance features all-over premium pigskin leather and most notably is made here in the U.S. at one of New Balance’s Maine factories. The 996 was first introduced in 1988 and with an improved midsole, (utilizing the ENCAP® heel with a C-CAP midsole) was the best stability and cushioning combo to date. The 996 also featured the first use of 3M Scotchlight reflective trim for safer night time running by New Balance. Only 47 pairs of the M996 will be available at Fred Segal (Santa Monica) beginning on May 13th. On the same date and location, there will be a New Balance West Coast Release party for the New Balance Sonic collection. The New Balance Limited Edition Boston 993, a special customized version of New Balance’s heritage running shoe, will debut just in time for Boston Marathon weekend. Available for men and women in colors inspired by the prestigious race such as black suede with lime contrast stitching for men and lake blue stitching for women. The limited edition shoes will also feature the words/letters “RUN BOS” on the heels of the shoe. The shoes are manufactured in the U.S. and will have a suggested retail price of approximately $150.00. Only 72 total pairs are being created – 36 women’s and 36 men’s. The Limited Edition Boston 993 will be sold exclusively at the Tannery on Boylston Street in Boston, Massachusetts beginning Friday, April 16th. Following the success of the initial New Balance for Nine West collection launch, spring 2010 introduces updated designs and colors while keeping the look bright, fun and light weight. Continuing to combine New Balance’s innovative performance and material technology with Nine West’s female fashion know-how, the fresh spring line introduces feminine patterns, materials and colors perfect for the modern woman. The New Balance for Nine West collection is designed by a team led by Savania Davies-Keiller and Roberto Crivello, New Balance Creative Directors, and Fred Allard, Nine West Creative Director. Material, color and design direction comes from both parties in a true collaboration of talent, technology and design. The project, a creative collaboration between New Balance, Swedish film director Jesper Kouthoofd and New Balance Lifestyle agency of record, Mother New York, was designed to revolutionize the way New Balance connects with the consumer and creates a new method of communication with the brand’s audience. Over the course of eight days, the first 88 (of 365) films were shot in Stockholm in a truly collaborative effort. Mother, New Balance and Jesper worked collectively to build film sets, engineer the film shoot and bring the project into existence. New for spring 2010, the 460 transforms into a holiday favorite. Wear your heart on your feet this Valentine’s Day with a New Balance 460 designed especially for the day of love. The sneaker features a translucent rubber outsole with a heart pattern and heart-shaped accents adorning the tongue, heel tab and insert of the shoe, allowing the wearer to send a subtle message of love for the holiday. Occupying more than 200 square meters, the New Balance Experience Store is located on the first floor of the Novel Building, Shanghai. With its charming brick walls, wooden display windows, nostalgic old telephones and iron chandeliers, the interior décor creates a sense of subtlety, which captures the legacy and essence of New Balance. The store feels both classic and modern, perfectly encapsulating the brand’s heritage and innovation. The Experience Store is designed such that a panoramic view of the ceiling unfurls the brand’s past, present and future, telling Shanghai the magnificent story of New Balance’s one hundred and four year history in making shoes. The new Experience Store on Huai Hai Road, Shanghai displays New Balance’s entire product line: sports footwear, apparel and a variety of sports accessories, available for all seasons and for men, women and kids, bringing the complete New Balance experience to consumers. Prime position is given to New Balance’s series of high performance running shoes. New Balance has always been at the forefront of technology and innovation in performance footwear. As a complement, the lifestyle series caters to customers looking for fashionable colors and elegant designs. These two series perfectly integrate high technology with fashionable design, exhibiting New Balance’s traditional craftsmanship and its modern spirit. For over one hundred and four years, New Balance has passionately and diligently held fast to the aim of producing the best quality and most comfortable products. Following an extremely successful and well-received launch, renowned sneaker brand New Balance is teaming up with Nine West to produce a second season of comfortable and stylish sneakers. The two brands combined their knowledge on innovation, design and style for the collaboration, which first launched in spring 2009. The second season, with new styles starting to trickle in this fall, promises new, equally fashion-forward styles in a variety of bold colors. Edek – An update on the popular Kiki style from spring, this hi-tech design features military-inspired waxed canvas uppers with metallic leather strap detailing. Available in two color combinations including: black/pewter and navy/copper. MSRP: $89.00. Adapted – This hi-top is funky, edgy and cool. Available in three color combinations including: black/white/red, black/white/blue and black/white/hot pink. More than 300 people came out to celebrate the launch of the New Balance and Concepts’ Freedom Trail Collection hitting stores on Black Friday. DJs Doo Wop and Brek.One entertained the crowd into the morning while guests enjoyed cocktails and sweets. The Freedom Trail Collection introduces the first ever 875 boot and re-imagines the 1500 sneaker-both in buttery chocolate nubuck and red lace detail. The collection was produced in limited numbers and will only be available at Concepts and select stores around the globe. New Balance and snowboard company, 686, celebrated the onset of cool weather with the East Coast launch party for their first-ever collection, 686 Times New Balance Collection held on Thursday night, October 22nd at renowned sneaker store, Concepts, in Cambridge, MA. More than 100 guests attended to view the collection. For the first time, New Balance and rider-owned and operated 686 come together to introduce a winter collection of boots, footwear, outerwear and accessories. The collection is a perfect combination of historical legitimacy, quality craftsmanship, technical wisdom and progressive minimalistic design. We call it: 686 Times New Balance. At the forefront of the 686 X New Balance collection is the 580 Times New Balance Snowboard Boot. The boot combines proprietary New Balance patented technologies including Rollbar stability and Abzorb cushioning along with 686 BOA FOCUS system and Recco avalanche technology. The result is a fully functional, technically advanced snowboard boot with a sneaker-like fit. To compliment the 686 X New Balance collection, we have customized one of our most celebrated silhouettes- the 580 – with Times collection colors and materials for off-mountain wear. From its origins in the mid 90’s as a trail running sneaker, to the special modern day partnerships between iconic Japanese brands, the 580 has become a global object of obsession. The 580 Times New Balance Sneaker features timeless design qualities, premium materials and technological footwear advances in footwear. While the 580 has a storied past, the special 686 models boast contemporary materials for clean styling and reliable comfort and fit. It is this combination of classic heritage and modern function that rests at the core of the 686/New Balance partnership. The 686 X New Balance collection will also include: 575 Times Insulated Jacket featuring Infidry dry technology, DWR durable water repellency and Recco avalanche rescue system technology; 580 Times 3-Ply Jacket with fully taped 3-ply seams, water resistant technology and Recco avalanche rescue system technology; 580 Times New Era Hat; Gradient Times Zip Hoody, Gradient Times T-shirt and Sole Times T-shirt. New Balance’s Black Licorice 442 collection for fall 2009 is a sweet combination of clean black uppers with bold neon hits. Available in black/fuschia, black/pink and black/lime versions featuring neon rubber outsoles and extra neon laces for personalization. Each pair comes in a special, Black Licorice black/neon collector’s box. MSRP: $55.00. Available at Shoe Carnival, Shoe Show and Finishline. New Balance and aerie by American Eagle, the intimates and dormwear line from American Eagle Outfitters, Inc. announces the introduction of the New Balance 600, a new fitness lifestyle shoe. The NB 600 is now available exclusively at all aerie standalone stores across the country. Offered at $65, the shoe is designed to complement aerie f.i.t., aeries fitness and workout wear line. The NB 600 features a comfort molded EVA sole unit, Abzorb (a proprietary cushioning foam that resists compressions for all day comfort) and a lightweight mesh upper. The 600 is available in two trendy color combinations of grey/pink and white/lime, the perfect solution for the girl who wants an athletic look without sacrificing fashion. With this program we have the opportunity to reach a style-savvy consumer with fashionable athletic footwear that merchandises with the incredible range of aerie, says Steve Gardner, strategic business unit manager for New Balance Lifestyle. It’s a program that brings a fresh perspective to product and merchandising, while synergizing these two great brands. Since its launch in fall of 2007, aerie f.i.t. has been a successful component of the aerie lifestyle brand. It includes a variety of exercise clothing and accessories including pants, leggings, shorts, sports bras, tees, tanks, hoodies, wind stoppers, vests, caps and headbands. Each piece is designed for high functionality as well as style. aerie Fit Sweat Free Fabric is wickable, pulling moisture away from the body, and includes Real Cool Cotton, which prevents overheating. Other details include hidden money pockets, reflective piping and special flat-seam construction. New Balance Trainers – 455 Revival! The original award winning trail shoe from 1979 gets updated. Re-launched for the first time in more than 30 years is the 455, an original 1979 trail shoe that has been updated with modern materials and sophisticated color blocking for spring/summer 2009. Designed and manufactured in New Balance’s factory in Flimby, England, the 455 has a three layer lugged outsole capable of dispersing shock and offering excellent traction-a lot of bells and whistles that stem from the fact that this was an actual award-winning trail shoe more than 30 years ago. The 455 was the trail shoe of its day and today remains a classic. Boston-based New Balance today announced the premiere of its first global Partnership Program. This program will celebrate the creativity and savvy design expertise of New Balance’s top retail partners in collaboration with designers and developers from the brand’s global product creation centers in the US, Japan and England. The Program will provide top global retailers with a forum to work with regional New Balance factories to produce collections that are regionally designed but available to consumers worldwide. “The New Balance Partnership Program is a unique opportunity to create innovative premium product in conjunction with some of the best global sneaker retailers,” stated Luis Navarro, product manager for New Balance Lifestyle. “We decided to take a different approach and have our Partnership Program partners fully participate in the product creation process. This enables us to showcase the style and creativity of each partner coupled with the high craftsmanship of New Balance to deliver a meaningful story,” stated Navarro. The program kicks off with a collection by the NYC-based boutique, Alife Rrivington Club (A.R.C.) and was designed and developed in tandem with New Balance’s USA team. Built on the classic New Balance M1300 silhouette, the A.R.C. collection celebrates a heritage style that was first introduced in 1985 as a premium technical running shoe. The 1300 features simple patterns, a long tip, one piece saddle and a PU Encap outsole for comfort. Designed to evoke the archetypical 1980s jogger, the A.R.C. collection is available in three material and color combinations-teal/grey, all-over teal and white with small pops of teal. “The materials selected follow our core classic Made-in-USA heritage. Pig suede on the tip, saddle, and foxing plus jacquard knit meshes are the staples used on many of our domestically-made shoes” stated Steve Cusick, product developer for New Balance. 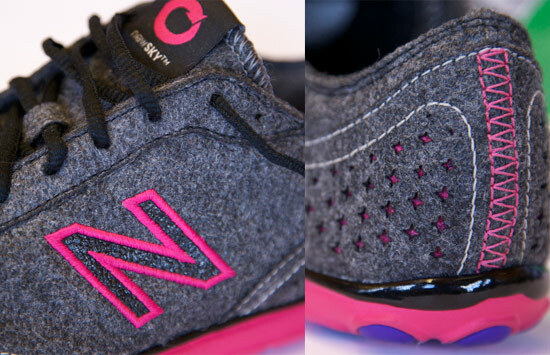 Cusick adds, “The inspiration came from both 1980’s joggers and modern New Balance classics. With quality and durability a high priority, we pushed to maintain the same materials on all three styles.” All color pantones of teal and grey were chosen by A.R.C. and everything visible on the shoe- suede, labels, laces, thread, inserts, meshes, soling- was a true collaboration of talent between the New Balance developers and A.R.C.